lovely... i can taste the spiciness by looking at the photos. I am going to bookmark this recipe for gingersnaps... some of my favorite kinds of cookies! I realise I did not reply to your mail..well, I did but parked in "drafts" because that's where my brain is these days. I apologize. This is simple and absolutely gorgeous! I could really see myself eat it for breakfast too! what beautiful pictures! 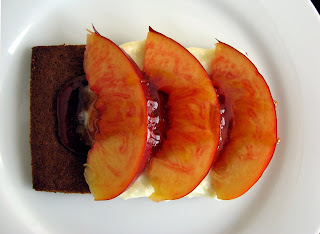 i love the combo of nectarines and ginger snaps. looks delish. Lovely pictures, very artistic. This recipe sounds very unique and delicious. What a gorgeous dessert! 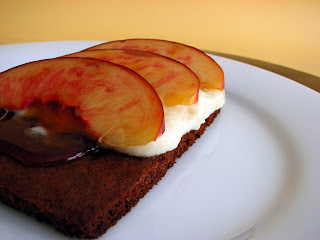 I love nectarines and I love what you've done with them here. 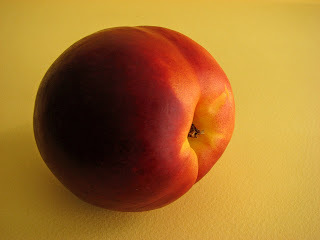 Lots of unique flavors and textures together with unadulterated nectarine flavor. Beautiful! These look delicious! What beautiful pictures. 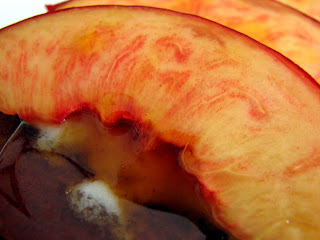 I love nectarines too, too bad they are really good for such a short time. wow, i love the simplicity of the presentation. plus the different flavor and textures sound like they'd be excellent together. nice job! This looks great. Your photography is really good too. The colors look lovely. Judging by the pictures, you can already tell how delicious it tastes. The color yellow just looks inviting. You can taste the sweetness just by its color!